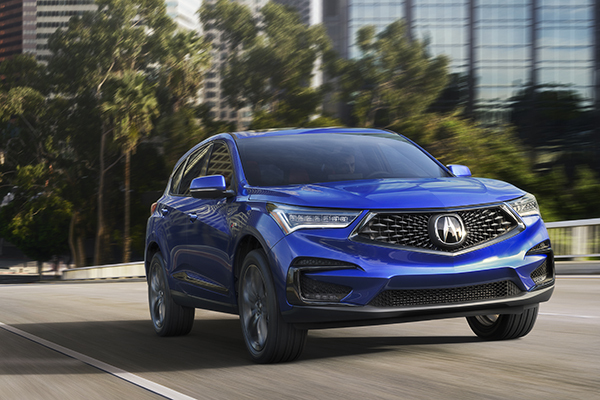 he 2019 Acura RDX has earned the highest possible award and safety ratings from the Insurance Institute for Highway Safety (IIHS). The 2019 Acura RDX has earned the highest possible award and safety ratings from the Insurance Institute for Highway Safety (IIHS). The 2019 RDX qualified for TOP SAFETY PICK+ thanks to a top rating of “GOOD” in all crashworthiness tests, standard AcuraWatch™ active safety technology that earns a superior rating, and available good-rated headlights. Since its launch in June, the all-new RDX has recorded six-consecutive monthly sales records to take the lead as America’s #1 retail-selling compact luxury SUV for 20181. Total sales for the year are on pace to surpass 60,000 units, marking a new all-time record for RDX. To earn the 2019 TOP SAFETY PICK+ award, a vehicle must earn good ratings in the driver- and passenger-side small overlap front, moderate overlap front, side, roof strength and head restraint tests. It also needs available front crash prevention that earns an advanced or superior rating and available good-rated headlights. The RDX’s standard Jewel Eye™ LED headlights are rated good, while the curve-adaptive LED headlights equipped with the Advance Package are rated acceptable. The 2019 RDX is built on an all-new, Acura-exclusive body and chassis architecture and incorporates a host of new premium features and technologies, including Acura’s award winning True Touchpad Interface™, an ultra-wide panoramic moonroof, available Acura ELS Studio 3D™ premium audio system, and next-generation Acura sport seats with up to 16-way power adjustability. The 2019 RDX is powered by a direct-injected and turbocharged 2.0-liter, 16-valve powerplant with DOHC VTEC® valvetrain mated to the segment’s only 10-speed automatic transmission (10AT). Peak output of 272 horsepower and 280 lb.-ft. of torque (SAE net) bests RDX’s key compeitors from Mercedes, BMW, Audi and Volvo. The RDX is available with Acura’s Super Handling All-Wheel Drive™ system, capable of distributing up to 70-percent of torque to the rear wheels, and up to 100-percent of that torque to either the left or right rear wheels, creating outstanding control and agility.